They set up a couple of large plastic drums and buckets and then began a rhythm pattern that had everyone captivated. Two guys, playing some plastic buckets and tap dancing on boards and we were all just staring at them and smiling! It made me think about how creative we can be when we allow the Lord to use the gifts He placed in us. I remember when we started The Landing Community Church we had a program called Tribal Arts where our kids made music with A/C vents, trash cans, PVC pipe and boards. Even then it was awesome to watch them express themselves in such a unique way. You may be battling some fears or depression in your life right now. Your hope and happiness can often be found in the simple things. I was encouraged and blessed by these two young men and their buckets and boards. 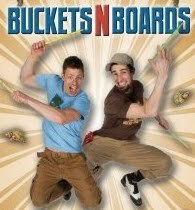 No elaborate stage, no moving lights and costumes...just buckets and boards. So let God use the simple things in life to inspire you and help you march to the beat of your own drums...or buckets! He wants to make beautiful music through you that will make others smile. Now I have to go. I've got utensils and dishes to start banging on!